Greetings to everyone in the mighty name of Jesus. This month, I was privileged to be part of 3 conferences: One Million Children Conference, Engage Conference and Youth Unshaken Conference. I was given the opportunity to speak at the One Million Children and Youth Unshaken Conference and my highlight was seeing a young girl in her wheel chair, Lydia Wilson from New Plymouth, giving out gospel tracts to all those who attended the One Million Children conference. 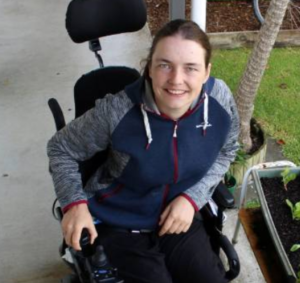 Despite having progressive muscular dystrophy, unable to speak clearly, paralysed from the leg down, she is filled with the love of Christ and the joy of the Lord. Lydia was handing out her tracts, talking to people, giving them hope that if she could do this so could everyone. Lydia brought tears to my eyes because in her, I saw the joy that sometimes eludes me and many of us as we become entangled with work, life’s busyness, family, relationship and ministry and here I see a young girl able to give a beautiful smile of hope and joy to everyone around her. She was radiant, a magnet, and everyone gravitated towards her – the reason was simple: she had Christ in her, the hope of Glory. She lived and spoke like Christ. I saw God in her and I witnessed His presence in her. She is doing all of this in a wheelchair. How much more should we be out there with both our feet sharing the gospel to a lost world that needs to hear about the hope in Christ, the eternal life that is awaiting them. Come on! Let’s go and preach the gospel. Romans 1:16 “I am not ashamed of the Gospel, for it is power of God at work, saving everyone who believes”, and Romans 10:15: “How beautiful are the feet of those who bring the good news to others”. Have a blessed month. I hope you are as encouraged as I am. If you have time please visit her blog at https://crossfoundationblog.wordpress.com/. Read her daily witnessing stories. Last month’s highlight was nearly a fortnight in Fiji assisting with the Leadership Development Training Course. My role was to teach the Spiritual Development section each morning, firmly based on Archbishop Harry Goodhew’s excellent guide, Growing Green, as well as to assist EE Australia and EE Fiji in the day to day running of the Course. It was a pleasure to join with the keen group who came for training. There were three EE National Directors; one from India, Malaysia and Mongolia, Field Workers from USA, Switzerland, Kenya, Tonga and the Marshall Islands and two young women from Australia testing their call to EE. While there, we went out witnessing in Nadi and 12 people professed their faith in Christ, including a man living with his family just down the drive from the Kennedy Training Centre. It was good to go out one morning and meet some local pastors who had participated in an EE training clinic course to assess its implementation and encourage them further. It’s hard to estimate the potential value of a course like this as these leaders scatter and return home to apply what they’ve learned. Please pray for EE leadership of all these nations to be greatly strengthened. My two boys have always enjoyed spending time with me, particularly if it involves anything outside. Ever since they learnt to walk, they would come running every time I trie to go outside. Somehow from anywhere in the house they would detect sound of me putting my shoes on, and would come running while yelling “coming”! They would never ask me about where I was going or what I was doing. They were too busy pulling their boots on as fast as they could to ask irrelevant questions like that. Sometimes this was just taking the compost out and other times it was going on big adventures like cycling. It didn’t matter what it was, what mattered was that we were together. Their eagerness to spend time with their dad reminds me of when Jesus first called His disciples. He simply said “Come follow Me” and “At once they left their nets and followed him”(Matt 4:20). Following Jesus is an adventure. Jesus is still calling each of us today to join Him in this adventure, to go where He goes and do as He does. So when you next sense Jesus calling you, will you jump at the opportunity? I pray our response will always be “coming!” Your adventure awaits!